What does it take to encourage the mass adoption of battery electric vehicles? L.E.K. Consulting’s latest research suggests that shifting consumer purchasing behaviour will take more than large investments in public charging infrastructure. It will require a fundamental shift in the cost competitiveness of EVs (as compared to internal combustion engine (ICE) vehicles on a total cost of ownership basis). Despite this activity, consumer response has been slow. For example, 1.2 million EVs were sold in 2017, which is just under 1% of global passenger vehicle sales. 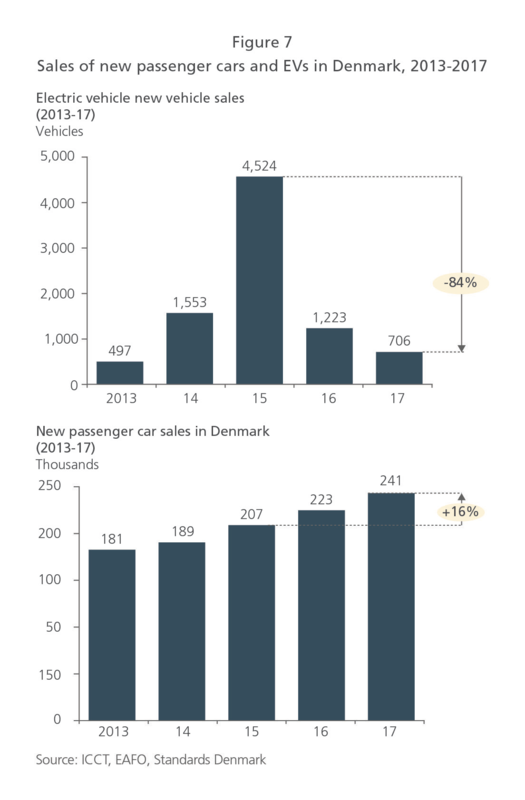 This is illustrated in Figure 2, which shows that — with the exception of Norway — EV sales have failed to gain traction in most countries. 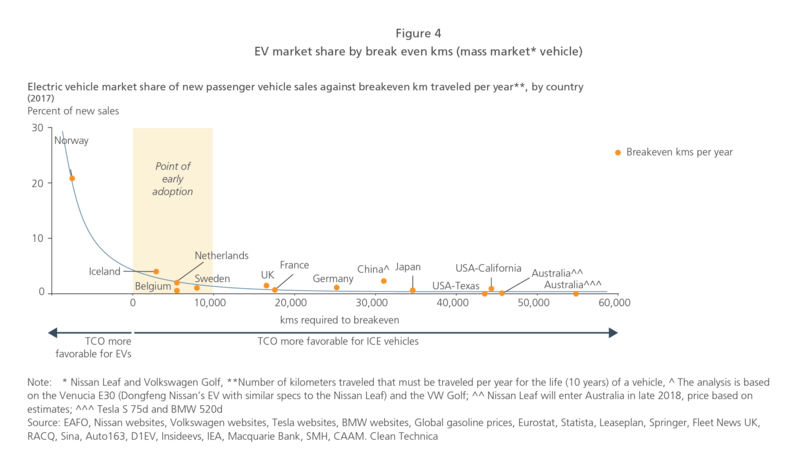 Despite low penetration of EVs to date, there are signs that there is increasing momentum around key factors that will increase EV uptake — cost competitiveness with ICEs is improving, the variety of available EV models is growing, and the EV driving range on a single charge is increasing. What are the key drivers of EV adoption? There are a wide range of supply and demand factors that will ultimately drive EV uptake. These are summarized in Figure 3. Of these drivers, L.E.K. analysis shows that the key drivers of early adoption are cost competitiveness with ICE vehicles, followed by access to public charging infrastructure and the availability of EV brands and models. L.E.K. analysis reveals that the most important driver of early adoption is the cost competitiveness of a EV and a comparable ICE vehicle2 on a total cost of ownership basis. While the purchase price for EVs is currently higher than for comparable ICE vehicles, the savings that accrue in operating costs mean that the TCO are the same when a specific number of kilometers (kms) are traveled annually. This distance is referred to as the kms required to break even, and the lower the break even kms, the more competitive EVs are on a TCO basis. 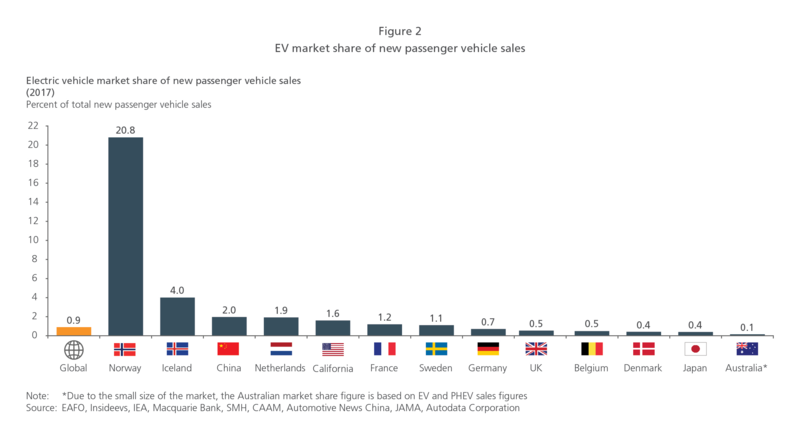 Our analysis of 12 countries shown in Figure 4 provides evidence that the lower the break even kms, the higher the share EVs have of new vehicle sales. This shows that the point of early adoption occurs when the kms required to break even falls below c.10,000kms a year. We undertook a similar analysis for the luxury vehicles segment. A similar trend holds true, although unsurprisingly, luxury buyers appeared to be less price sensitive, purchasing EVs well before the point of early adoption. A case in point is Norway, where the rapid rise in the adoption of EVs followed the creation of favorable conditions, most notably generous subsidies resulting in EVs being better than cost parity with ICE vehicles — leading to the break even kms being negative. Another example is Denmark (as shown in our case study below). Our analysis also found that, while public charging infrastructure is important, it appears to have had little effect in encouraging early adoption. 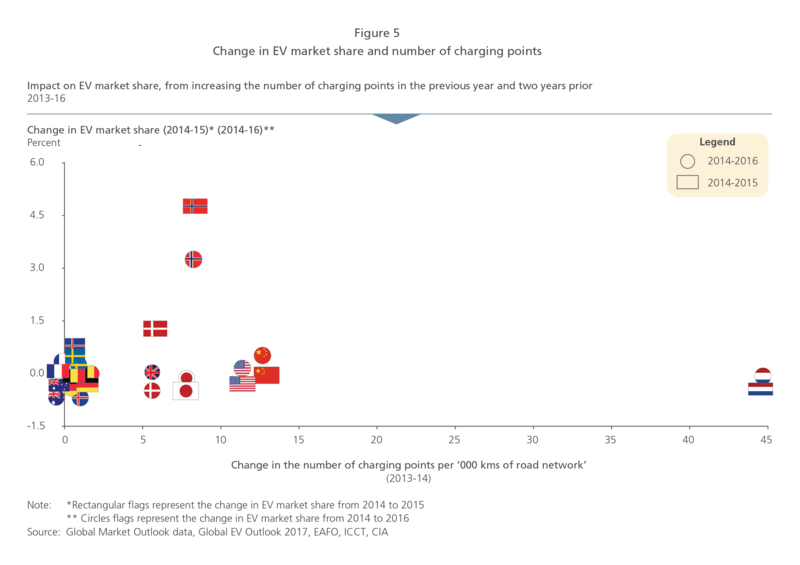 We looked at the relationship between public charging infrastructure and subsequent growth in EV market share (1 and 2 years later) across 12 countries. Our analysis in Figure 5 shows there is little correlation between investment in public charging points and increased EV adoption, in recent years. This suggests that large investments in public charging infrastructure will not in isolation drive EV uptake. It also suggests that while range anxiety is important for some, it is not important for everyone. As Figure 6 illustrates, the battery range of EVs far exceeds the average distances that users travel each day, suggesting the majority of users to date have been charging at home. This suggests that early adopters are most likely to be dual car households or short-range travelers, with access to at-home charging. 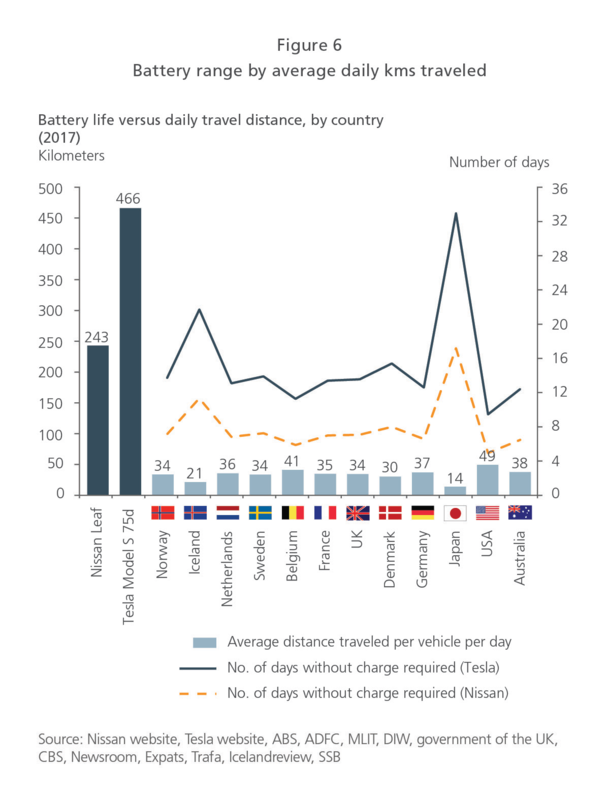 Range anxiety could persist in markets where there is limited access to home charging, or where car owners are more likely to make longer trips, such as in the United States. For those who make regular long-distance trips or for high-mileage users, access to high-speed public charging infrastructure will likely remain a barrier to uptake. Given this, rapid public charging infrastructure along key highways connecting cities should be prioritized ahead of in-city charging options where at-home charging options are available. In cities and towns, charging infrastructure investment should be prioritized in locations where cars are parked for the majority of the day, for example at home, at work, and in multi-modal transport access locations. The number of available EV models will also have an important impact on future demand. 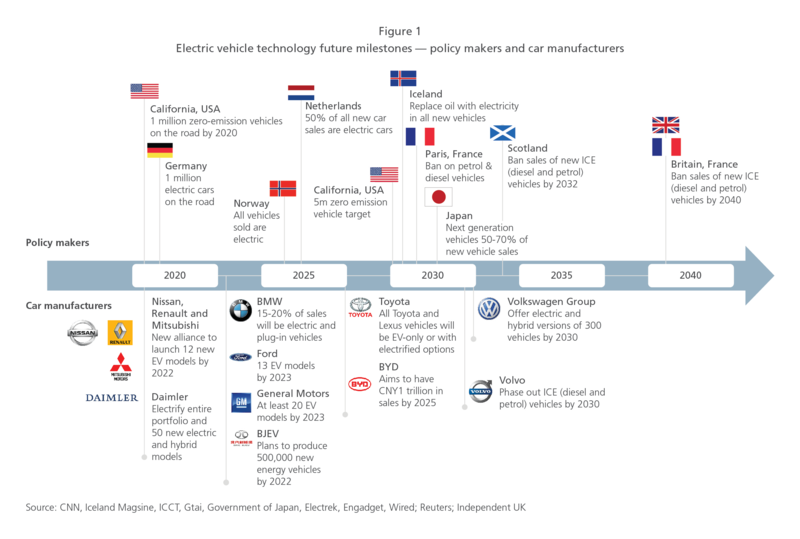 As indicated in Figure 1 above, a growing number of car manufacturers plan to increase the variety of EV models in the near future, providing customers with greater choice — especially for mass market vehicles. This will increase both competition and scale of production for EVs which, along with continued declines in the cost of batteries,10 will put downward pressure on prices and increase the competitiveness of EVs. A rise in the variety of EVs available suggests that customers will be more likely to find models that suit them and that word-of-mouth recommendations could fuel further interest and adoption. The combination of falling prices with increasing suitability and convenience could mean that EVs are approaching the point where demand could materially increase. What are the implications for Original Equipment Manufacturers (OEMs)? Our analysis shows that cost competitiveness of EVs with ICEs is the main factor that will drive early adoption. Given the size of the gap in price between an unsubsidized EV and an ICE vehicle currently, manufacturers will need to focus on innovations and increased scale of battery production to bring down the costs of EVs. As the sales of EVs rise, governments are likely to scale back their level of support, meaning that manufacturers will need to be prepared to compete unaided with ICE vehicles. In markets that are less price sensitive — such as for luxury vehicles — or for those where government support is insufficient for EVs to compete with ICE vehicles, manufacturers will need to demonstrate non-price value. For example, as well as offering basic value-added services such as maps and navigation, they could also provide personalized smart and driverless systems or shared mobility services. fully consider the customers’ needs and identify options to monetize opportunities associated with home and public charging and battery storage solutions. How should policy makers respond? Policy makers looking to make investments to actively drive early EV uptake should consider focusing on incentives that lower the up-front purchase costs and ways to increase consumer understanding of whole-of-life costs in preference to initial investments in public charging infrastructure. Governments can also play an important role in encouraging EV uptake by purchasing EVs for government fleets as well as public transport vehicles. It is also appropriate to begin long-term planning on how best to integrate EVs into the electricity grid. Policy makers could explore ways of capitalizing on the storage potential of a parked fleet of EVs, by enabling them to provide energy in peak scenarios (where practical) to enhance the resilience and stability of the network, assuming lower cost than would otherwise be possible with stationary battery applications. 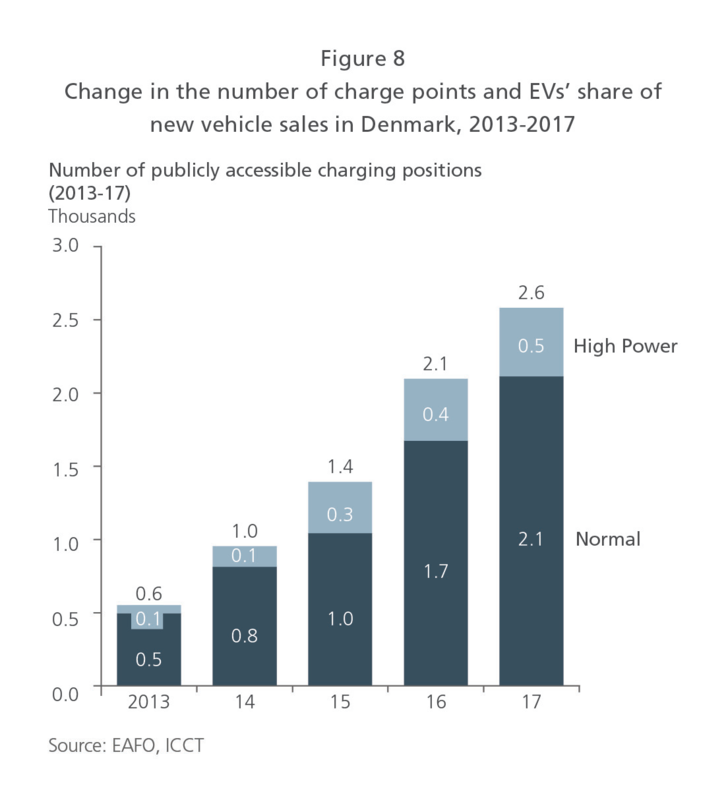 Denmark’s experience with EVs strongly supports the finding that price competitiveness with ICE vehicles is a more significant factor in the early EV adoption than the number of charge points. Toward the end of 2015, the Danish government decided to gradually phase out tax breaks on electric cars which, until then, were exempt from high import taxes. Sales of EVs jumped ninefold from 500 to 4,500 between 2013 and 2015 when they were exempt from import tax (Figure 7). However, following the removal of the tax exemption, sales fell by 84% within two years — almost back to 2013 levels. Over the same time sales of new passenger cars grew at 16% p.a. This dramatic fall in the sale of EVs coincided with an almost doubling in the number of accessible charging points (Figure 8), demonstrating how critical the competitiveness between EVs and ICE vehicles is to customer decision making. 2 Total cost of ownership refers to all costs incurred over the life of the vehicle, including the vehicle purchase price, fuel, maintenance, insurance and net non-penalty government charges such as stamp duty and registration less rebates/subsidies.